Like the fishermen following Jesus, Elisha gave up his prize belongings and work as a farmer to follow closely Elijah who called him. He stuck close to Elijah, and would not let him out of his sight. At the end of the day he wanted a double portion of the Spirit he saw on Elijah's life, and this was no bad thing. We will be telling some of the incredible stories of Elisha between now and Christmas - each week understanding how God powerfully moved through this servant. Suggested reading is 2 chapters a week, starting in 1 Kings 17 (Elijah), continuing to 2 Kings 13 (the death of Elisha). See how Elisha started as a mentee of Elijah, and clung to him closely as a disciple - eager for a double portion of the Spirit to fall on him. Do we have the same kind of attitude in our discipleship? Elisha then lived by the Spirit with God working remarkably through his life, giving rise to the various stories that make up this series. 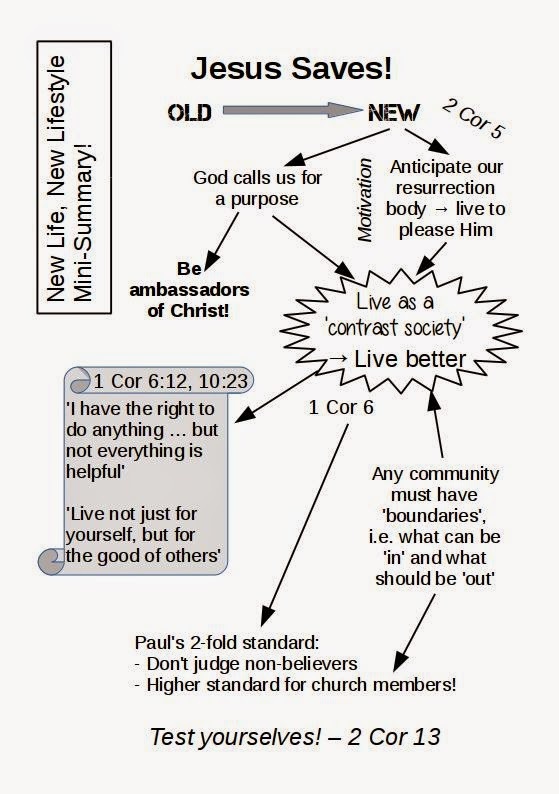 A graphical mini-summary for the New Life, New Lifestyle series. Paul draws his second letter to a close with the simple instruction: 'Test yourselves'. How do you measure up? How is your own faith in Jesus? [OUT] Does your discipleship help bring others towards Jesus Christ? We love new stuff, and society relentlessly urges us to buy even more new stuff. That programs us to think that existing things lose their value, that the old has no purpose. We have to ask are these lines of morality just about our sexual behaviour? Churches can seem so pre-occupied with sexual sins, do they become blind to other issues? Does God have different 'levels' of sin? Any group standing for a cause will inevitably have to sanction one of their own if a member's behaviour contradicts that cause. The Corinthians had such a case, and an extreme one at that. The bottom line is that our behaviour matters - if we are no different to those around us then we show no obvious signs that we have been saved from anything, and we set no contrast to society. [IN] Is God calling you to greater purity? We all know the pressure to conform - people or things vying for our attention. The problem is of course that things done wrong leave us entangled, caught up, potentially in lifelong patterns that we cannot break. We end up like a puppet on a string. The good news is that Jesus can set us free. Free to say no, free to be who we are truly intended to be. This freedom is a wonderful thing, theoretically it gives us the right to do anything, but as Paul says not everything is helpful - either to ourselves or those around us. There are some things we obviously will want to steer clear of. Yet there might well be 'grey areas', or things that are more subtle. A mobile phone is good to use ... but do we end up letting our technology control our lives? Maybe some things we have to intentionally abstain from because they are an issue for someone we are with. That 'helpful to others' aspect can be more important than we might think. So our freedom comes with responsibility, a choice to avoid things unhelpful, to be discerning of things that might affect us, and to deliberately self-limit for the good of others. In crude terms this all means setting ourselves 'rules', either individually or maybe as a family or group to help ourselves live better together. Such rules are not imposed from on high, but us limiting our own freedom to enable ourselves and others to thrive. There is a clear call in Paul's letters for Christians to live differently. That immediately triggers questions and tensions of how we do this while remaining in the fallen world around us. The 2 Corinthians 5 passage sets the backdrop: we live in anticipation of our resurrected-at-home-with-the-Lord bodies, but meanwhile we must live out our lives in the current world. The resurrection is made possible by the work of Christ - God's action in our lives. As believers we have responded to God's love initiative, literally falling in love with Him which initiates a desire to please Him. So having been born into new life with God, we now pursue a new lifestyle. This lifestyle sets an example for others, especially as we show natural concern for friends in their own situations. Yet we should not be surprised if genuine offers of help are not always welcome, since our example may simultaneously be leading our friends to realise the broken-ness of their own lives. Our lives are therefore a contrast to the world, shedding light on it rather than simply conforming. Whereas others hide, we can live 'real life' because in Christ we can face our own personal regrets, know forgiveness, and move forward. This is not just an individual effort, but something we do in Christian community. This inevitably leads to questions of what ongoing behaviour is acceptable in that community - the 1 Corinthians 5 passage speaks into this. To follow Christ, to live differently, will doubtless mean giving some things up, not simply going with the flow of others. Not easy, but part of the demands of staying close to Christ. In a culture where almost 'anything goes', the challenge is to be distinctive, and to do that in a way that is positive. Growing closer to Christ helps us understand who we really are, which enables us to be true to ourselves and God's desires for us rather than being pulled any which way. This is not about laws or rules but being free to live for Christ - that growing desire to please Him. Key Qn: [UP] Are you living to please Him? Yet note the 1 Corinthians passage makes clear that it is not for us to judge non-believers who embrace every and anything around. To be distinctive is not to be pointing the finger, nor simply isolating ourselves! Paul actually advocates a 2-standard system: one applied to non-believers, and then higher requirements within the Christian community. We stand now, and will be raised some day with new bodies, because of Christ's work in us. How are we living up to that right now, and going forward? [UP] Are you living to please Him? Near the end of the first letter Paul suddenly jumps back to the basics - the basic gospel that they first responded to. He gives a superbly concise version of the gospel in v3-4. Its always worth us having such a crisp view in our minds ready to share when needed. Yet the brevity of words opens huge concepts. The resurrection of the one man Jesus Christ shows the general principal of resurrection for the many. The converse logic is true also (v12) - no resurrection of people, then surely Christ was not raised either. In this case we should all pack and go home, its futile (v14-19). For Paul everything hangs on the physical resurrection of Jesus: without it we are still in our sins (v16-17). That ought to make us curious - for didn't Paul start the letter with a resolve to know nothing other than Christ and Him crucified (2:2)? Is it not in the cross where there is the power to save? The answer is that you can't have one without the other: cross with no resurrection leaves just a dead body with holes in, and no cross means no possibility of resurrection! Paul is emphatic: v20 Christ has indeed been raised from the dead. He has led the way, and from this all else now makes sense. In fact it radically changes our understanding of death, the end of our current lives. Death is not something to be feared, in fact it can even be embraced. It is not the end of the road, but more the point of take-off, like an aircraft leaving the runway. As Christians we should live in the comfort of this reality. Further it is important to understand (v44f) that Paul is talking of physical resurrection. We don't leave our old bodies behind and become floating spirits - Jesus appeared with a changed-but-physical body, so will we. God renews creation, rather than simply binning it. He takes it forward to its fulfilled purpose. That raises lots of questions of course, which Paul admits (v35), but is content to sum up in v52 as 'we will all be changed'. Of greatest importance is to understand that Christ is raised first because He is Lord - He reigns! Now everything, bit by bit, is being brought under His Lordship. For that reason we can now expect signs of this breaking in to the now. This is why we should not settle for situations being stuck in decay, despondency or despair, but rather pray in the Name of Jesus for His transformation to be seen. We may not see all the transformation immediately, but rather than just giving up let us resolve to get even closer to Jesus. So as the term starts, and we discover broken life scenarios through our church's activities, let us live and act in the light of the risen Lord, praying expectantly for signs of resurrection life to appear in lives across the city. Imagine you are hiring someone. Candidates cvs roughly match and meet the job requirements. Who do you choose? Probably the person you already know ... because relationship trumps the other factors. You can't beat getting to know people. The Zambia trip is about that - seeing, hearing first hand their story, their work. Every time you meet someone, you can influence them - point them to a better way, even point them to Christ. In that sense we are all leaders, because we can all influence others. Of course every organisation has recognised leaders, certain positions. Yet we must not forget that such leadership is enabled by relationship - one person influencing another. Paul hits on this principle in chapter 3. Positively influenced people become a letter of recommendation for others to read: people might now see Christ because of Paul's original ministry among the Corinthians. As we seek additional leaders we legitimately ask who might be commended - the answer lies written in lives of people around us! We are all invited into new covenant ministry - setting people free in Christ. It is an invitation that we can see from scripture applies to women and men alike. Father, Son and Holy Spirit all desire, commission and empower for this to be so. The invitation works through us in the various ministries and initiatives of the church. Whether it is a regular children's club back at base, or a potential new work at St. Johns, Stour Green, or even aspirations at Ely North, we are to be in the business of leading people to freedom in Christ. Paul says this new covenant ministry is not bound in Old Testament law, but finds freedom in the Spirit. Let us not be tempted to read Paul's writings as some kind of rule book: that leads to tablets of stone and risks our hearts becoming stone. Rather live in the confidence of Christ which brings grace and freedom. If we are to be bound in any way, it is only to Christ: let Christ take us captive as per 2:14. That makes a good acid test for a possible new leader - are they sold out for Jesus, led in His procession, being an aroma that might draw others to be captive to Christ too? The answer to that for any one person lies not necessarily in cvs or checklists, but by knowing them and the evidence of letters of recommendation. Such letters, I suggest, have probably already been written on the hearts of many people in our congregation. In Paul's dialogue with the Corinthians he calls on them to plan to give in the first letter, and then follows up on those plans in the second letter. Regular planned giving is a good thing. It is especially useful for charities and churches since it brings stability and enables good budgeting. As a church we are dependent on God bringing gifts through his people. This year we were slightly worried that giving may be insufficient, but praise the Lord because our financial year end show a modest surplus of £197 - He meets our need! Regularly giving and being able to give when special collections are called for is a spiritual discipline. Yet regular standing order giving (which with gift aid is the simplest and most efficient way for the church to receive gifts) should never be seen as simply automatic, with no heart connection. We give because everything we have is a gift from God in the first place. God has entrusted each of us with resources - do we hoard them or deploy them? The invitation to give is an invitation to release and enable. Additional giving to the church general fund could ultimately release additional people to minister, adding to and enhancing the diverse ministry of volunteers. Giving to our hall refurbishment project releases us to turn concept plans into actual plans and enable an attractive environment for various ministry to take place for decades to come. This releasing and enabling always has an outwards ripple effect, bringing blessing far beyond the original imagination. From the amounts given or pledged this weekend we will send off 10% to build a classroom and toilet block in slum areas of Lusaka - freely giving as we ourselves have received. In the second letter Paul does not give a command, nor does he specify how much people should give. He simply says give from the heart based on the principle of abundance of God. The word in 9:7 is the Greek word for 'hilarious' - God loves a hilarious giver: someone who is so abandoned to God's love that they release resources with joy and generosity, celebration and dancing, electrified with the possibilities of what God can do ... all because God Himself gave in the first place. Paul was free in Christ. Yet he strategically gave up his freedom in order to enter the world of different types of people in the hope of bringing them the gospel. He accepted limitations and embraced inconvenience for this purpose. So who is God calling you to bring good news to? How can we do that in the mix of all the other stuff in our lives. Our family, our work etc. pose legitimate calls on us. Can we be 'given over' to God's call without trashing these other life departments? Christians have offered answers, for example suggesting a pecking order of God - spouse - children - and then church stuff. There is good reason for this: sadly there have been casualties in churches from time to time. Yet is that simple? If we put God as number one, then doesn't that compel us to serve ... and won't we do that with our faith community (i.e. do 'church stuff')? Perhaps better to consider balancing a ball on a tray. The tray has various things on it that call for our attention, yet tip only in one direction and the others are neglected. Plus things change - family members get sick, redundancy at work comes along ... many things that change the landscape, requiring a re-balancing. Life is one long balancing act! Let your relationship with God permeate all departments, don't compartment off different aspects of life. Let your children see your faith in action ... even in the struggles of life. Work out your calling - what is your life (your 'tray') supposed to be about? Maybe there is stuff that shouldn't even be on your tray, or you can sit light with. If you honestly and prayerfully balance with your calling in mind, you can trust into God's hands the important factors in life (e.g. your children's longterm wellbeing). In other words, honour God and He will honour you. An application of these tips is to bring your children to serve with you. Not always easy, and sometimes the source of conflict to be prayed and worked through. Paul dialogues with the Corinthians about how they relate and view leaders. Paul makes it clear that it is not about rights but about 'given lives' - lives given to God's call and the ministry work. A church can only function with such lives operating at all levels (from the routine tasks up to strategic leadership). In Seeking to Worship, Seeking to Serve we will try to ensure what we do makes sense in terms of our mission purpose, simplifying where possible, re-arranging and re-distributing where that helps. Yet the bottom line is that each ministry area of the church can only happen if there are given lives. Key Qn: [OUT] Who is God calling you to bring good news to? How are you challenged, what do you need to adjust, to balance the tray that represents your life? [OUT] Who is God calling you to bring good news to? Acts 19 gives a story of some earnestly seeking believers who somehow seem to be missing something. They had John's baptism but not the overwhelming experience of receiving Jesus and the Holy Spirit. Receiving prayer they start speaking in tongues and speaking the words of God. How many Christians live an earnest life yet seem to be missing something? Any tradesman who comes to do a job will turn up with their toolbox - proper tools for the job. Recall from last week that to each one is given the Spirit for the common good. Some are given the ability to supernaturally know, others to speak God-directed words, others incredible Spirit-given faith, others see God work miraculously. These are like tools in the toolbox - why go out and try to serve with an empty toolbox? Key Qn: [IN] What is God placing in you to play your part? We hope to take God given life across the city, where people are broken and hurting. For this we need the Spirit to be empowering us with tools for the task. A sensible suggestion for starters is to seek God regarding the gift of tongues - it can be viewed as an entry level gift, just as it signified the Spirit's first outpouring in Acts 2, initiating the Gentile church in Acts 10, and the Acts 19 story. It gives Christians a tangible experience of the supernatural. It is also uniquely a gift that individuals can use at their will. The most common objection I hear is that people don't see the point. Yet that is because they are British - they want to be in control.The real point is to let the Spirit be in control, and pray through us. When I'm in a tight-spot I need God-prayers, not my own inadequate words! Beyond tongues Paul clearly stresses prophesy, because it goes beyond the individual to benefiting the whole group by revealing the mind of God. For believers and even un-believers it can become very apparent that God is among you when the Spirit enables people to speak God's thoughts into the situation! Whether you experience the Spirit in a whacky experience, an over-whelming sensation, or just a gentle breeze doesn't matter. Paul repeatedly says 'eagerly desire' ... so go on, take the challenge, step up and be open to receive. [IN] What is God placing in you to play your part? New life in Christ for every Christian is a Spirit-animated life. It is no longer just a biochemical reaction, no longer just to consume. It is filled with God given purpose, and God given enabling and ability to strive towards that purpose. The important words are often the little words. In Paul's letter it is quite clear that each one has a part to play. The Spirit gifting is not just for a select few or for some keenies, but for every believer. The parts will of course be different, and operate to varying degrees, but all have a role nonetheless. The other important phrase in this passage is for the common good. The Spirit enables for God's purposes that build up everyone and reach out. As a church we want to take this God given life out across the city - God will do this by His Spirit working in each and every one of us. You may feel God cannot possibly work through them, perhaps looking at how you have messed up so much in the past. Yet it is not about you, nor your mess. God has already come down in Jesus Christ to put that right, allowing the people of the day to consume and discard him, but in so doing setting down life as we know it. God raised this Jesus to new life: a Spirit-animated life which we can all now participate in. Our past mistakes, the brokenness and fractures that result from them are all taken on that same cross. If we are prepared to let him, that old way of life can be washed away, drowned, lost for good. It is replaced by new life, with the Spirit working in us, giving us a whole new perspective, a purpose. Not just for us to feel better about ourselves, but to help restore a hurting world. The way of Christ is the way of love, and is the 'most excellent way'. It lays down human strength and power. It waits for God to raise up. Human strength will bash its way through, drawing attention to itself, boasting and being proud. It will pick on weaknesses, re-surfacing past incidents in the other and capitalising on opportunity to do the other down. It will quickly and easily flare up, horns ready to be locked in combat. Even apparently helping and serving others can carry these traits of human strength, undermining the very thing being offered. With such traits operating underneath the way of love is not seen. Yet with all our pretence laid down, with kindness patiently holding out for the best in others, looking for truth, hoping and persevering for what surely 'can be' with God, the way of love becomes visible. God and the love that He had for the world that caused Him to come down, to die, to be raised to new life, is brought into view through our own actions. This way of love is the most excellent way. It does not fail. Here is the full resource pack of teaching resources on Love, Spiritual Gifts, Leadership, Giving and New Life New Lifestyle that were used with this the Wisdom of Christ Part II message. Last week we considered the incredible power dynamic that God uses: laying down power in human terms - going even to death on a cross - for God to raise up again. This confounding principle runs through both letters and is seen here in the first chapter of the second letter, only this time seemingly in Paul's own life. Paul talks of sharing in the sufferings of Christ for the benefit of the Corinthian Christians and others, and yet also the comfort from God. Paul is no stranger to hardship. Later in the letter he will spill out a whole list of times, many of which taking him close to death. Yet each time God brought him through, and Paul is convinced that it all has a purpose: to show the world the power of God. Paul is a living parable, a story-told-through-life, telling the story of power-laid-down-for-God-to-raise over and over. This is for the benefit of others, so that they may come to believe. They can then share in the sufferings too, i.e. also become living parables. So the Key Qn introduced last week remains pertinent. If we are not prepared to lay things down, even through suffering, we will not be able to live the story, and thus not tell the story. This is why this principle underpins every aspect of teaching we can get from these important letters. Whether it is love, spiritual gifts, giving, leadership, or living the 'new life' in Christ, all of it is informed by this same principle of life laid down for God to raise. For it is in this principle that the power of God is revealed, i.e. the ability to 'get things right' in all the various departments of Christian life. The King of Denmark stands out in World War II as one who quietly defied the Germans, by riding un-guarded through Copenhagen each day, and by suggesting that should the Jews be required to wear badges then all Danish people should wear the same badge too. This was simple non-violent opposition, laying down power. This and other examples echo the principle Paul writes of in Corinthians: that God came down and allowed himself to be taken to death, even death on a cross, to be raised again by God alone. This is the power of God - totally different to the power of the world. Its a nonsense message for most ('foolishness' 1:18). For Greeks and Jews alike it just didn't compute. Today, for Secularists and Muslims to name a few, it also simply does not add up. Yet this is the power of God all the same. So much so that Paul resolved to nothing but this power (2:2). He didn't need clever words, just this basic power (2:4-5). We too must return to this principle in our churches. Like us the Corinthian church had various issues - the pair of letters makes this clear! Yet see Paul's approach - in the 2nd letter he appeals with the 'meekness and gentleness of Christ' (10:1). He will not use the world's ways, but instead looks again to the power of God, i.e. the power of Christ crucified-yet-raised (10:3-4). Rather than wading in with fists, law-suits, tribunals, or plain institutional authority, he lays his apostleship on the line, seemingly prepared to give it all up ... in the hope that the church members can be 'built up' rather than torn down (10:8). Don't forget Paul had every right to lay into them, but instead he lays down his right to power. Key Qn: [UP] Where is God calling you to lay things down and trust Him? Let us resolve to know nothing but God's power made available through Christ crucified and then raised. Paul urged the Corinthians to be a spent people, lives laid down for others. Let us be the same for Ely and whoever we meet. As we encounter people, we do not bring our CV, our cleverness, our strength ... but our own experience of the risen Christ. We can offer this for people, praying in their situation to know this same power - the power of the Spirit made available when human power is laid down. [UP] Where is God calling you to lay things down and trust Him? Studying in 1 and 2 Corinthians: "Key Values - Learning from Paul's dialogue with the Corinthian Christians"
Read two chapters a week starting this weekend - through 1 Corinthians first and then the 2nd letter. With a couple of break weeks you will be done by the end of August. The teaching will be picking themes, which draw from both letters together. Easter encapsulates the full range of emotions. For example see things from the viewpoint of Mary (mother of Jesus) - the pain and anguish of seeing her son killed, the confusion of his claims seeming to have come to nothing. Then she is met with an awesome sight on the Sunday morning, finding the tomb without the body yet a radiant angel telling her 'He is not dead, but alive!'. With tears of confusion and yet joy she tries to tell the others that Jesus is alive. Our culture offers us many things or experiences that claim to give us joy. What in reality brings absolute joy? Is it that bigger house, the new car, the promotion? The irony in the gospels is that the reality of Jesus being alive was right there in front of them, yet at first they completely missed it! Jesus stood in front of the Mary Magdalene, walked with the pair on the Emmaus road and then stood in a room among the disciples. Yet when the reality hit the over-riding emotion for all of them is joy. Not a momentary joy, not something that they just consumed and was then gone - but a joy that would last. The Emmaus road pair realised that their 'hearts burned with joy' because Jesus had been with them. Thats a joy that their hearts could pump through their veins, filling their whole being so that whatever bad times may come (and they surely did) they could now respond differently, bearing the joy of the risen Lord. Many since have had the same experience - Wesley famously wrote in his journal that his 'heart was strangely warmed'. This is not a consumer experience, but a life-changing lasting reality. [OUT] How can you share the story of Jesus' death & resurrection with others? If the reality of Jesus being alive has been injected into our hearts, if the indescribable joy that goes with this truth is flowing through our veins, then we should find ourselves naturally shining, able to tell the story, and encourage others to meet the risen Lord for themselves. Key Challenge: Use the Try Praying booklet and then give it away! We all make special preparations for an important visitor, getting everything ready and in order ... hopefully with time to spare so that when the doorbell rings we can show our guests straight in. As in Luke 9 Jesus sends the disciples out to proclaim the Kingdom and heal the sick. They go and get on with it, learning as they go! Ever wondered how Jesus was able to sleep through the storm? The panicking disciples awoke him, and then he commanded the wind and waves to be silent. Not only did Jesus have power over creation, he also had peace, resting safe in the love of the Father. [IN] What aspect of your discipleship is God challenging you about? What are the stories of our children? Sadly in many ways the evidence suggests a general lack of well-being, a sense of 'not being good enough', 'not worthy'. Any thought of God is lost in the suggestion that God would not be interested in them anyway. It's a story that can also be repeated in adults, even older people. Has society turned us into commodities, so that we simply feel we do not count? The disciples had seen amazing things. Jesus had sent them out to do as they had seen him doing, going in his power and authority. And they went! They proclaimed and they prayed for those in need ... and saw God work. It must have been incredible and fantastic, seeing God work in the same way through them - a real high. For them the reality of Jesus and his Kingdom was now surely sinking in. Think how you learnt to do various tasks, like riding a bike. The reality is for many things we learn by doing - perhaps after a bit of a demo or advice we then have to get on with it. Jesus understood this: having prepared for ministry, announcing his Kingdom, and then demonstrating it, he then commissioned followers to go out and get on with it. [UP] Do you know the King more deeply by going about the King's business?